Okay so we have done the basic set up. 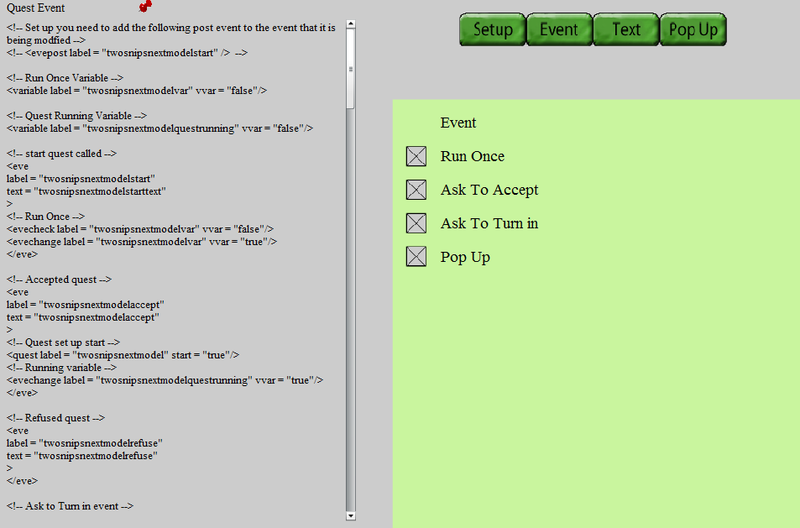 All the events are already labeled with a name for us now making event creation so simple and all the text is also named. There went 30 minutes of copying and pasting. Lots and lots of events on the left hand side but just a tiny amount on the right hand for options. Thats because I did all the heavy lifting for you. But to be on the safe side I'm going to go over everything so that way modding should be easier. I really don't expect anyone to use the quest creator as a direct tool some basic changes will by needed. Hopefully though most of them are marked with comments. First off though lets look at the options. Run Once, basically will the quest giver offer this quest every time you meet the quest giver or only once. Default is only once. Ask to accept. The quest giver will ask if you want to take the quest or just force you to take it. Selected is ask. Ask to Turn In. Same as before will ask if you want to turn in rather then forcing you to turn in. Pop Up. This quest has a girl turn in pop up at the end. If not your doing a fun custom quest most likely a fetch and carry. That's the entirely of the options lets go look at what they make. 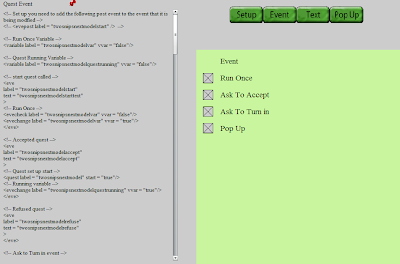 Not selecting them will remove that section from the events xml. 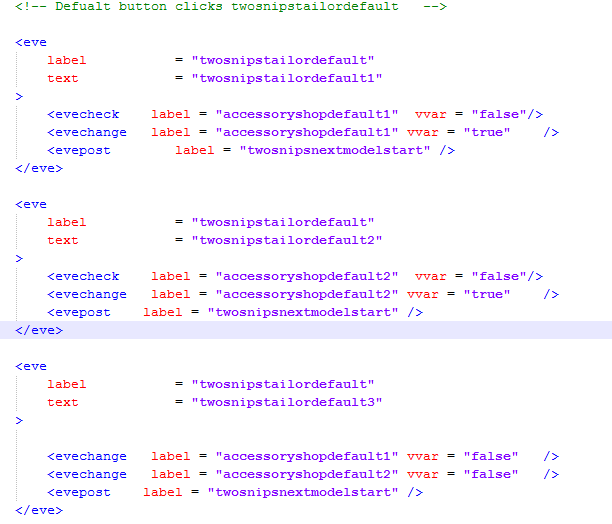 Lets first off make our xml file. 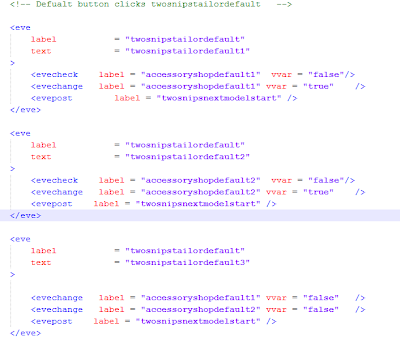 Copy and paste all the xml into the new file. Yes it's about 3 pages worth and we are going to go over it quicly. Right at the top the creator gives you a postevent to add to current events. Postevents run after the current event is finished running. They do not stop other events from running first but the point is there easy to tag onto exiting events. I'm going to go add it to Souseki's talk events. Now when you talk to Souseki the quest will fire after she does her basic talk. There are other ways to intercept the events but this way works. Next up our the variables. Really simple here. The run once means that the quest is only asked once. That was one of our check boxes above. The other one just confirms that the quest is running. No reason to pay them much mind. A lot of the next items are straight forward with in line notes. I am just going to point out important stuff. Accepted Quest - Player said yes to taking the quest or was forced to take the quest and the quest is added to the quest book. Refused Quest - Player said no to taking quest. Ask to Turn in Event. - Player is back ask if the quest is done. Note this event has the same name as the start event and will trigger each time the start event would trigger. This can be changed by renaming the event and calling it from a different location. Declined to Turn in Event - Player said he/she/it wasn't ready to turn in the quest. Win give reward - a few notes the times for the reward are here already for you if you filled them out before. This marks in the quest book that the quest is completed it also stops the quest dialog from appearing on the quest givers. Failed Turn In - player went to the pop up but didn't have the goods. 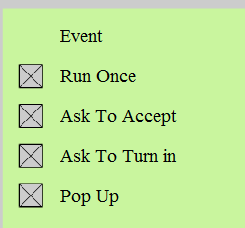 Fail out event if quest has already run or finished - A blank event if the quest is not running. REQUIRED! That's it for the events. All the heavy work there is already done for you. Now onto Text.